Called to be bonds of communion between cultures and between local churches, we keep in touch with our church of origin. Interested in its life, we try to share with it the riches we have received from other churches, using particularly the times of return to our home country for renewing contact (SMSM Constitutions 46). Throughout our history we have been blessed with the support of our families and our friends and benefactors, who have been mission partners for us. Our pioneers keenly awaited the coming of the mission boat to bring them needed supplies, as well as letters from loved ones, with messages of support and assurances of their prayers. We Marist Missionary Sisters of today also rely on the prayers of others to help us as we face new challenges. We count among our blessings the generous benefactors who support us as we serve the poor through teaching, nursing and pastoral care, always with special concern for women and children. You too can become a mission partner with us. You can pray for us and the people whom we serve. 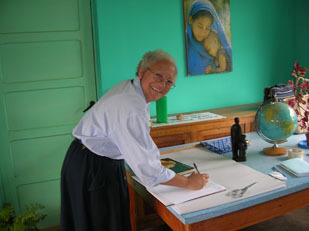 You can help support a missionary sister or a missionary project by sending a donation. If you are a young single woman between 20 and 35 years of age, and you feel called to offer your life to God for the service of mission in the manner of Mary, you can find the information about how to join us on the “Contact us” page.